Fuel + Air = Power... If you want to increase your engine output and are using things like bigger cams, intake, high performance headers, or forced induction then you must use higher flow rate injectors. 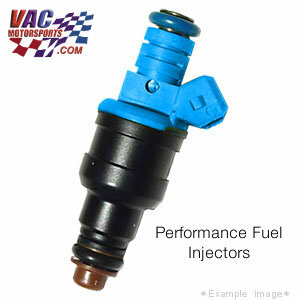 Our fuel injectors offer outstanding idle quality, consistent flow, resistance to clogging, and the durability only an OEM manufacturer can provide. These quality's are essential for high performance and racing applications, but also for street vehicles as well. Larger than stock fuel injectors should not just be 'plugged in'. To run and operate properly, your ECU will require use of Custom Performance Chip or Flash, or if you are local, dyno tuning. VAC can provide this for you below! If you run out of fuel to match the incoming air your engine will be at risk of running lean and causing serious damage! Please always use a wideband A/F monitor for engine safety. From Marc Fitzgerald of gatineau, Quebec on 3/16/2013 .